Childhood Revisited: Radish And Carrot! I guess not so many people will get this one unless they were 90s children. 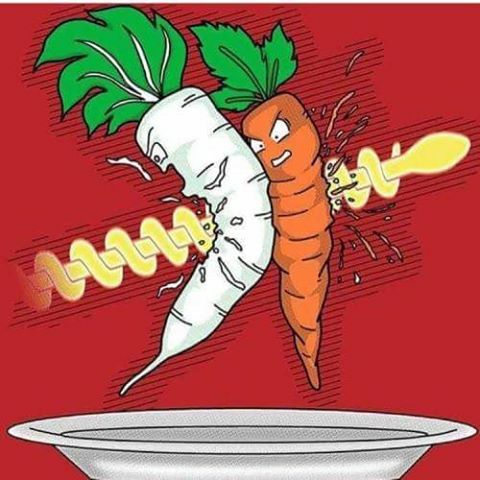 The whole answer is that the names of the Saiyans were based on vegetables. Saiyan is a pun on Yasai or vegetable in Japanese. Goku's original birth name was Kakarot (Carrot) and Raditz is obviously based on Radish. It's no surprise either that Planet Vegeta was once known as Planet Plant, its two warring races were the Saiyans and the Tuffles (truffles). Plus, the king was named Vegeta though why isn't the current Vegeta named Vegeta Jr. instead?